Regency was selected from a group of young stud males imported from Australia. 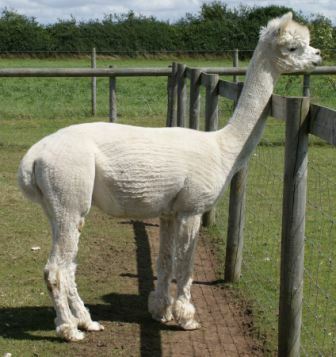 He was chosen for his desirable fleece characteristics, fine fibre, uniform crimp, brightness and density and his excellent genetics. Sired by Jolimont Commisario, a prolific stud in Australia with Peruvian background, many of Commisario's progeny have had show success in Australia, including Show Supreme Champions. Indeed, here at Cherwell Leys we have our own BAS English Show Reserve Champion, with Grand Sire Commisario, Cherwell Leys Spirit of Islay. Regency has worked successfully throughout the 2008 season and has progeny here to view at Cherwell Leys from a variety of dams, all showing excellent fleece and perfect conformation. Regency has all that you could want in a stud male, excellent conformation and good solid bone structure coupled with his supreme quality fleece with excellent coverage, which parts to show organised high frequency crimped staple.